I will try to be as brief as possible here. To remove Crypto Locker 2015 just follow the instructions below. In case you’re not sure if this is the exact virus (there was a previous version in 2014) the following image should be of help to identify it. You can just skip ahead to the removal part, but I recommend you read the rest as well, because in this delicate situation, I believe it is in your best interest to know as much as you can about this threat. 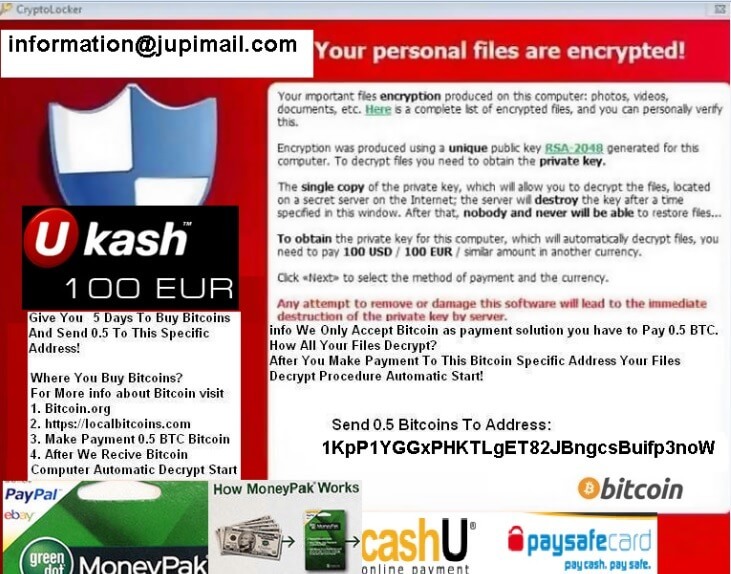 This is a ransomware virus. Unlike the majority out there it is extremely malicious and dangerous, one of the highest class. It works by encrypting key files and shortcuts on your PC and asking for bitcoins or downright for money. Do NOT pay the ransom at the suggested adress. 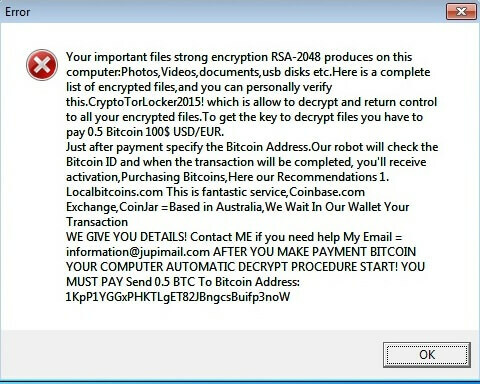 There is absolutely no guarantee that CryptoLocker 2015 will release your computer. On the contrary, there are many reports that suggest the opposite. I repeat, there are reports that say Crypto Locker 2015 will not decrypt your PC even if you pay. Another undeniable reason not to meet the demands is that by doing so, you will give the people who made the virus your personal information, which opens a whole new can of worms. After CryptoLocker 2015 enters your system, it proceeds to encrypt the majority of your personal files, meaning any mp3 files or other music formats, documents, personal videos. Practically everything that may have a value for you. There are some rare cases when it even goes as far as to block your connection to the internet although that actually runs contrary to its goals. Soon after you discover that you can not access your files, it starts making demands in broken english, like the ones above. CryptoLocker 2015 then displays a warning that you were “caught” in some kind of non-legal activity and you are subject to a fine it encloses. Although for many users the message may seem real, ask yourselves this? What kind of a legal authority asks for a ransom, and gives you the option to pay with BITCOINS? This alone should clue you in if nothing else does. This is a 100% illegally bred virus that you need to remove before it does any permanent damage to your PC. From now on, you should avoid EVER downloading any free programs and pressing Express Installation or agreeing to all Terms and Services. I know it’s hard to read the whole thing, but freeware, no matter how useful they may seem when you download them, are a nest for malware like CryptoLocker 2015. To make absolutely clear what I mean: at some point, either in the T&S, or during the setup itself, you agreed to install Crypto Locker 2015. That’s why you are in this situation right now. At least that’s one way this virus can sneak on your PC. The other paths are to open infected links, advertisements or spam email attachments. If this is what happened, then you’ve probably learned your lesson and won’t do it again. 2 Once you do that, you should just start tapping F8 incessantly until a new screen shows up called Advanced Boot Options. 3 There, you choose the Safe Mode With Networking Option. 4 At this point your Windows should boot. 2 Unfortunately there is no way you can get back the shortcuts on your desktop. Just delete and create them anew by finding the files you need, right clicking and choosing Send To Desktop. 3 There is also the matter of the picture that always comes up. It hides in different places, so you’re on your own for this one – find and delete it. 4 As a last note I am giving you a link to a Decryptor that MAY possibly work. No guarantees. This isn’t an exact science. But hopefully you can use it to decrypt your personal files and save them from CryptoLocker 2015. I hope everything works for you. If we were helpful, please consider following us on our channels on Google+, Twitter and Facebook. It will be immensely appreciated, because it will help us grow and in turn – that way we will help more people. I have to disagree with the claim that downloading freeware will give you Cryptolocker. While there are a lot of free software that comes with suspicious bloatware, there also are a lot of credible ones out there. To dismiss a lot of anti-viruses, or anti-malware which may come free is kind of dangerous, in my opinion. Also, in step 1, you mention entering Windows in Safe Mode. What if Windows does not want to boot? Sometimes this can happen. I think the safest bet is to use software that can work even if Windows cannot. Rollback Rx for example can remove Cryptolocker with it’s instant restore properties. The good thing about this software is that it has it’s own operating system, and so does not need Windows to work. Thank you for the comment. There is nothing wrong with some difference in opinions, so I respect yours. Whatever else may be said though, I need to express this – the number one reason for all virus infections is freeware. That is simply a fact. Maybe I was overvehement in my explanations and probably came off as dismissive, but my primary thought now – several months after writing this article – is that freeware COULD be dangerous. If you check out some of my newer articles I clearly illustrate the point that users should simply learn how to spot the malicious ones. As for the software you suggested, I encourage anyone to try it. However, I took a look at it and saw that many of its features are paid, so perhaps it is not the best solution. There are many anti-malware programs that can get rid of Cryptolocker 2015, which are also paid and can protect you for months to come until your subscription expires. And that is also some food for thought.